The trap is about 3" wide x 1 1/4" tall x 2" deep. 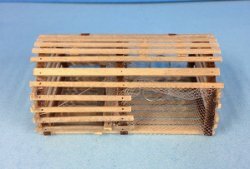 This trap has the netting inside and it is easy to understand how the lobsters come through the hole but cannot get back out. This is a working replica of lobster pots commonly found in New England waters from Marragansett Bay to Down East Maine, It is attached to approximately 150 feet of rope with a buoy at the end. Each lobster fisherman has his own serial nnber and buoy color combination for easy identification at sea, The traps are baited with a oily fish and dropped overboard among the rocks and ledges just off shore to about 2 miles out.